I have mixed feelings about this time of the year. It is the swan song for the dry fly and as winter's grip takes a hold, we will turn to nymphing techniques to continue through the ever shorter days. Much as I love grayling, by January I will be craving the longer more fruitful days of spring and a chance to cast a dry fly at salmo trutta, the brown trout. 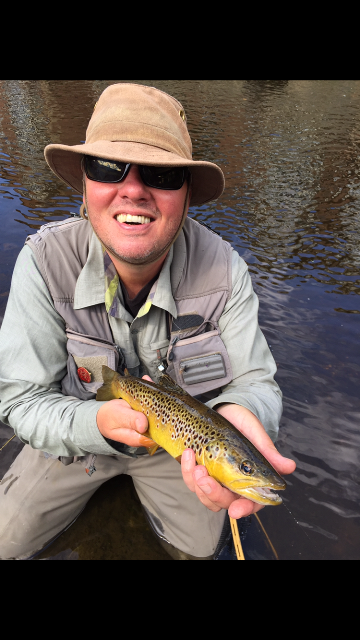 My interest in wild brown trout is such that now I will be giving a presentation on the topic at a Salmon and Trout conservation UK meeting. This will be in a traditional Yorkshire pub www.fleece-otley.wixsite.com on 12th January. The cost is £5. Please contact the Secretary if you are interested in attending john_rishworth@yahoo.co.uk. I have long been in admiration of the brown trout although Spring Watch the other evening somewhat stole my thunder. It is the most polymorphic, diverse vertebrate on the planet. A small acidic stream adult brownie might be 8 inches long and his brother introduced into a still water with masses of bait fish might be 40 inches. This incredible adaptability lies in those special genes. Brown trout can be stocked into non perennial rivers and yet still survive in the system after it runs dry? Yes the brown trout can leave the freshwater environment entirely and become a sea trout. As a Sea trout it can reseed brown trout into a river. Simply amazing! However at this time of year it is to grayling, the lady of the stream our attention is diverted to. 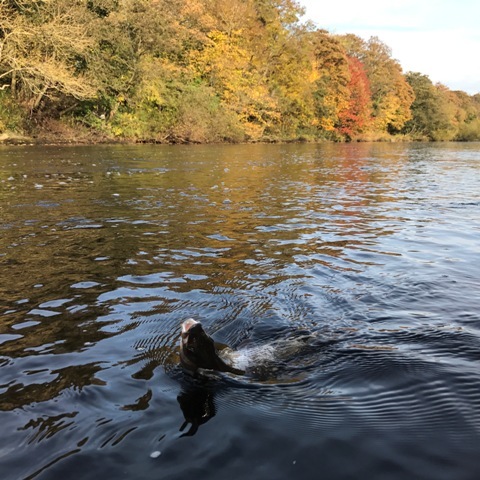 The last of the leaf fall will mean the last of the rising fish within the next 2 weeks or so. I recently fished the lower Itchen fishery and came away with a prize for the biggest fish of 45cm. The ever reliable match the hatch pale wateries caught 2 37.5 cm grayling as well. Probably the only dry fly caught fish that day! Dry flies for the dying days include the “f”terrestrial, pale watery 16 and Griffiths gnat in the smallest size 20. Chalk stream fish are often very pretty but lack the brutish power of bigger fish on steep fast flowing rivers like the Teviot or Annan. Myself and the current English Rivers Champion Fred Bainbridge will be running a series of master classes for grayling including trips for specimen grayling. Other trips will be on typical dales rivers. Please get in touch via the website for details. Fred has tested the nymphing drop indicator from the website and says it is likely to become his go to French leader. It meets his very high standards. 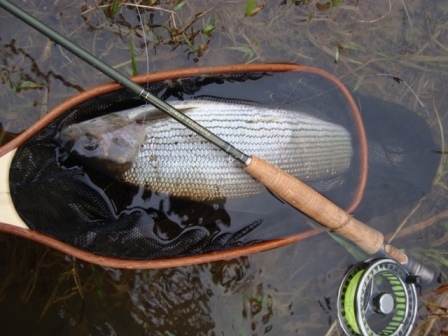 The hard frosts that have now set in will signal the start of grayling moving to the deeper sections of the pool and Nymphing techniques using a French leader or under an indicator. I have made a limited special offer (first 10 only) nymphing box featuring classics like the black magic and the absolute grayling destroyer the new purple and olive. Overall its over £40 worth of flies for only £25 in a silicon insert fly box. 6 hares ear red tags (smaller flies for top droppers or at range under an indicator), 3 UV flash Caddis 4mm (deeper heavier flow point), 3 red 5 nymph 3.2 mm silver, 3 black magic, 3 p and O 3.2 mm , 3 rainbow caddis 3mm, 3 flashback caddis 3mm. 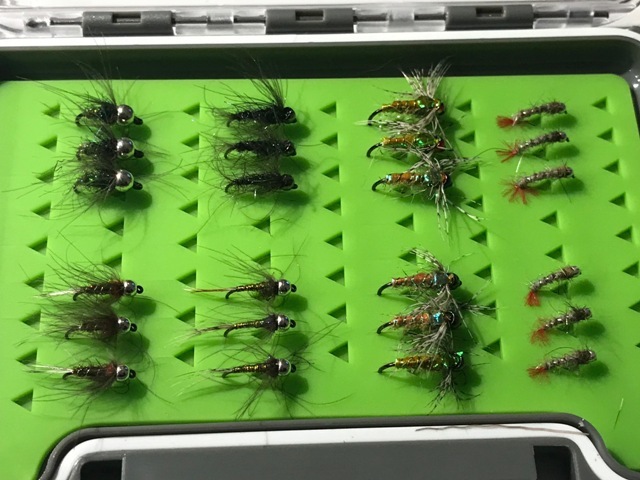 Get in contact via the site with Grayling nymph box offer in the subject box and I will send an invoice for £25 plus £2.50. The first 2 buyers get a nymphing leader with indicator free. Happy nymphing!